You have to give it to Cocotte’s Head Chef Anthony Yeoh, young at 30-something, but creates some very creative and mouth-watering dishes. He not only innovates for the sake of being innovative and different, the dishes actually taste superb. There are few reasons why you may not like this place: its obscure location at Wanderlust Hotel, difficulty in parking at the Jalan Besar district; and the never-ending road-works around which makes navigation tougher than normal. 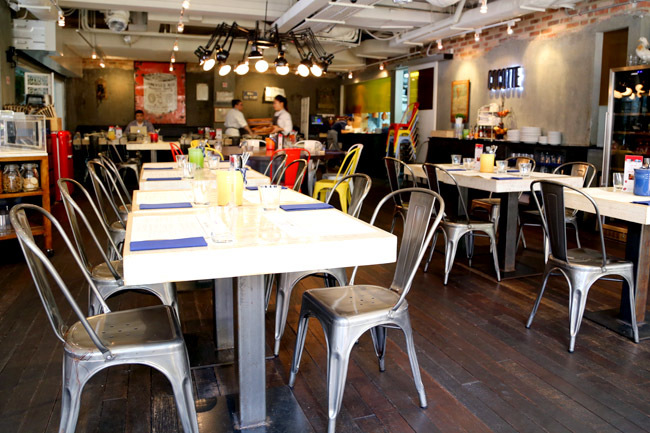 But its quirky-hip meets country-side style décor and food makes it all worthwhile to come. Usually you get cheese or charcuterie served with Cornichons (tiny pickled cucumbers). 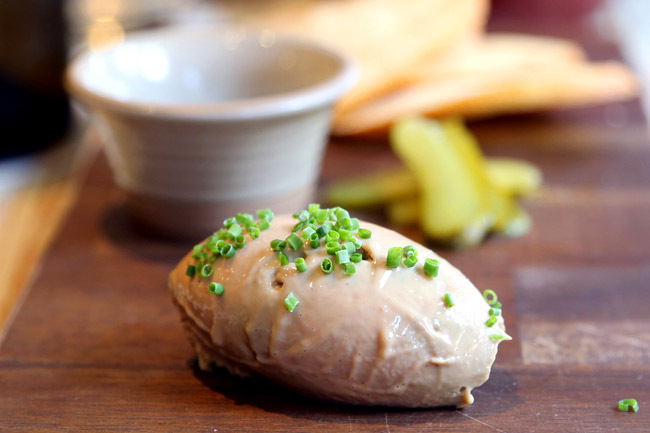 At Cocotte, you get a scoop of Foie Gras Mousse ($14) which you spread like earth-coloured jam over the cornichons or bread. A twist to this well-known French delicacy, their Foie Gras Mousse is rich, buttery, delicate and yummy to the max. In a French restaurant, I would usually order a French Onion Soup to go along with some bread or Sandwich. Chef Anthony came up with something that combines the two – a French Onion Soup Sandwich ($10) with caramelized onion confit and melted gruyere cheese on top of a toasted country baguette. This is really combining the best of both worlds, and it is not as if it is very pricey. 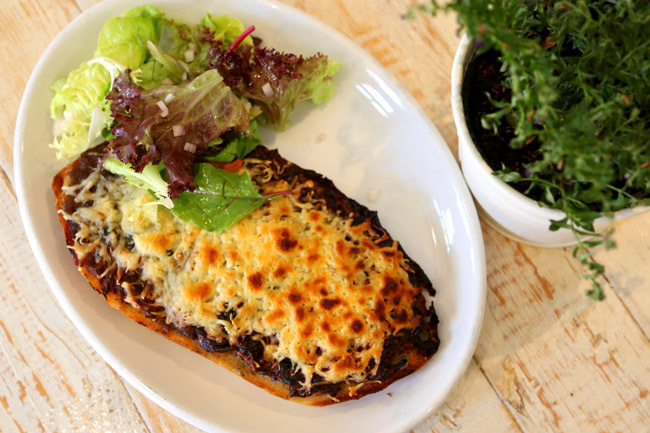 Chef explained that he came up with this because traditional French onion soup can be time-consuming to prepare for lunch-time crowd who wants a quick fix, inspiring him to re-create that same taste on a sandwich. Really one of the best memorable sandwiches I had in a long time. 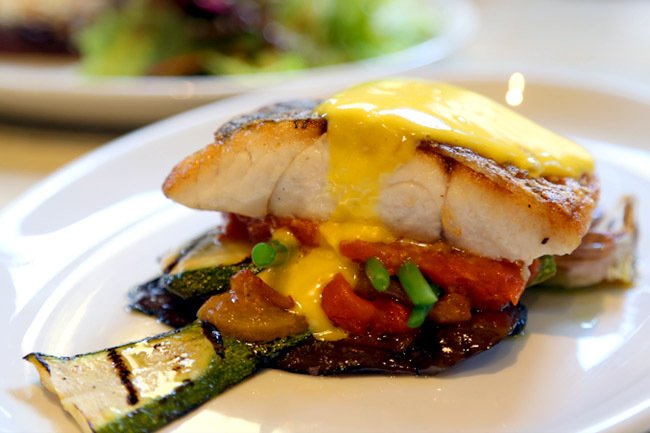 Other new offerings include the Asparagus and Fennel Salad ($16), Pan Fried Seabass with Saffron Aioli ($14) and Grilled Boneless Chicken Leg with Fresh Herb and Garlic Butter ($12). 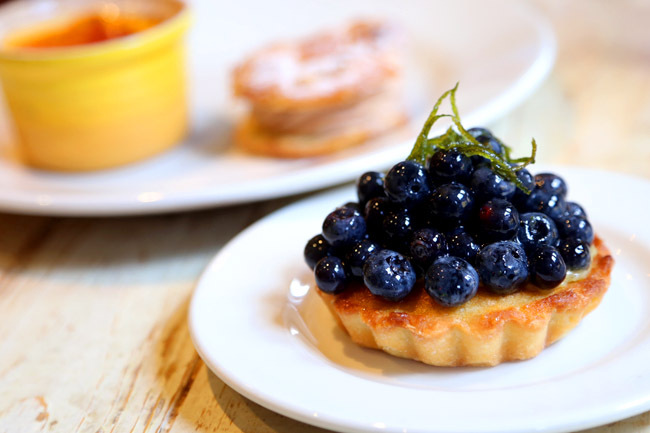 Not forgetting a new pastry and dessert counter that you will leave space such as their Blueberry Tarts ($4.95) and Crème Brulee ($9.00). My female friends always tell me they have a different stomach to digest desserts. I didn’t believe them till now. I shall go..hehe..parking is not a requirement for me..akeke. I love cocotte too, but I’ve always seen their cuisine to be very rustic bistro fare, fitting along the theme of communal dining. No disrespect to the Chef (I have a lot of respect for him and his team to be fair), but to use the word innovative doesn’t feel right, because a number of chefs are doing the same thing? Doesn’t do justice to the likes of the people on the forefront on culinary innovation. Just my 2 cents. 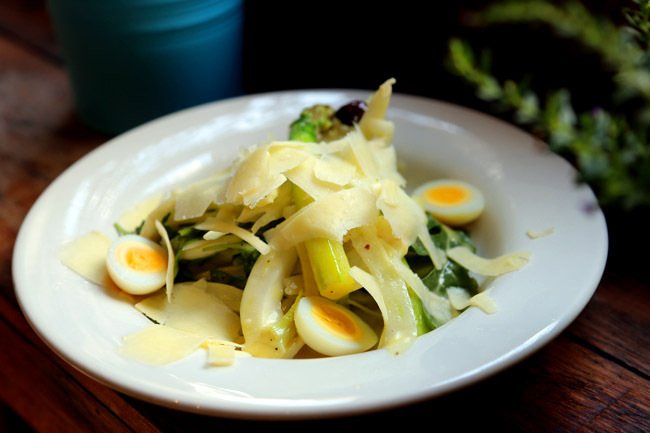 The team at Cocotte are creative in their own right, and produce brilliant dishes without a doubt. True enough, I get what you are saying. There are really a lot of chefs out there who are pushing boundaries. 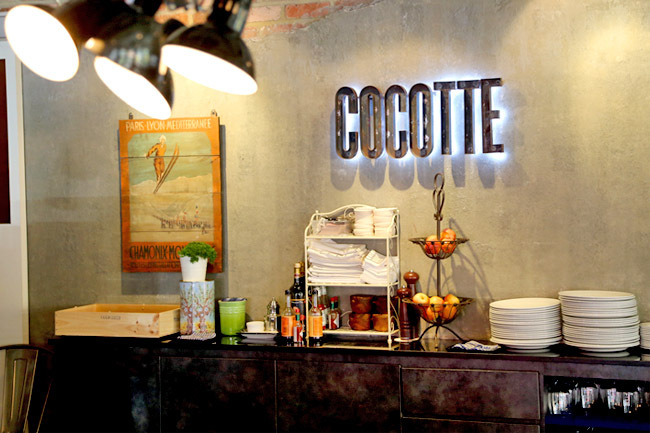 On a scale, yes, Cocotte may not rank that high in that innovation scale. Should have used a better word ‘re-invent’, ‘give a twist’. Perhaps. Unlisted Collection: features a stable of unique, high quality boutique hotel properties and restaurants in Singapore, London and Shanghai. Our hotels are set within heritage listed buildings which have been sensitively restored and re-adapted into radical, cutting edge lifestyle concepts that culminate into an unforgettable experience for our guests.